From March 13 to 15, 2018, the 10th edition of LOPEC, the International Exhibiton and Conference for the Printed Electronics Industry, will take place on the premises of Messe München (Germany). In addition to new printing materials and machines, exhibitors from all over the world will showcase numerous prototypes and commercial products with printed electronic components. The product range extends from sensors for environmental monitoring to 3D-printed components with integrated RFID technology. Whether it is extremely thin sensors, conductive nano inks or rollable glass as a carrier material: There is no shortage of innovation in printed electronics. At LOPEC 2018, machine manufacturers, material manufacturers and users from a wide variety of industries will present their innovations along the entire value chain. “We have already been feeling the positive mood within the industry during the planning stages of the trade fair. Several exhibitors have increased their exhibition space significantly compared to the previous year,” says Barbara Ismaier, Project Manager for LOPEC at Messe München. 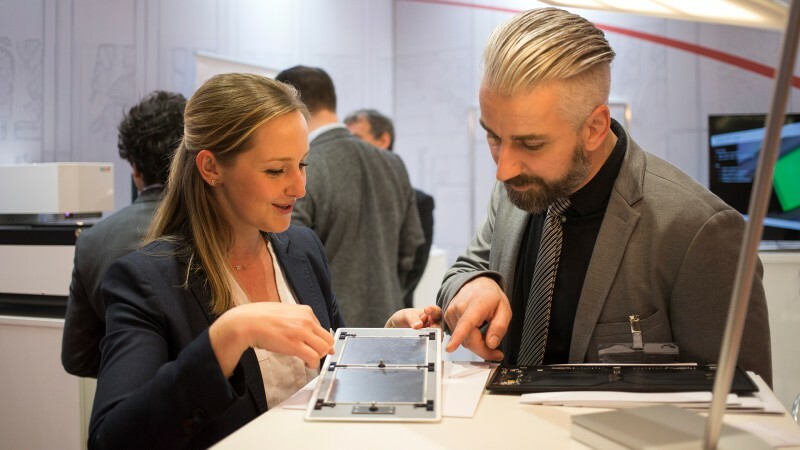 With even more prototypes and commercial products than in previous years, the LOPEC exhibitors make it clear that printed electronics has successfully made the leap into various end-user industries. The drivers include the increasing demand for sensors, which are just as essential for the Internet of Things as they are for the Industry 4.0 or the health care services of the future. The advantages of printed sensors are obvious: They are not only thin, lightweight, flexible and cost-efficient to manufacture, they also perform a wide range of measurement tasks at a high degree of reliability, as demonstrated by several LOPEC exhibitors: The US company Brewer Science, for example, will be presenting printed sensor technology for the monitoring of environmental parameters and industrial processes. The sensors measure gases, humidity, vibration and more. German companies will also be presenting new products in Munich. Hoffmann+Krippner, for example, will demonstrate a pressure sensor for fill level measuring, Witte plusprint a sensor platform for the Internet of Things. The Swiss Research and Development Centre CSEM, on the other hand, will be presenting printed electronic patches to be worn on the body. They incorporate sensors, displays, solar cells and rechargeable batteries. Particularly exciting: the high-tech wound dressing MediLight with sensors for temperature and oxygen measurement as well as an LED that heals chronic wounds with its antibacterial light. Further promising prototypes and product developments ranging from smart textiles to disposable biosensors will be on display at LOPEC at the stands of leading global research centers such as CeNTI from Portugal, VTT from Finland and Holst Centre from the Netherlands. The continuous advancement of printing systems and materials forms the basis for the triumphant advance of printed electronics. “This is why we are excited about the many exhibitors from the mechanical engineering and new materials sectors,” emphasizes Ismaier. Conducting tracks and other silver structures continue to play a key role in printed electronics. Several challenges of precious metal inks and pastes were meanwhile eliminated: Genes'ink has, for example, developed a cost-efficient option and also offers a low-temperature silver ink for printing on heat-sensitive plastic films. Another highlight from the French company is a transparent conductive nano ink for printing organic light-emitting diodes and organic solar cells. This provides an alternative to the elaborate high-vacuum coating with indium tin oxide (ITO), the availability of which is limited. More and more LOPEC exhibitors rely on smart components with integrated electronics. The Fraunhofer Institute for Manufacturing Technology and Advanced Materials, for instance, embeds printed elements such as sensors or RFID transponders in three-dimensional objects. For example, integrated RFIDs serve as a seal of authenticity against product piracy or for component identification. ELANTAS, a subsidiary of the German chemical corporation Altana, has developed a thermoformable silver screen printing ink for in-mold electronics, where printed electronic structures are placed into the thermoforming or injection mold and then in-mold decorated. Sun Chemical from the US will also be presenting a special silver ink in Munich: It is suitable for 3D printing technologies and also facilitates the integration of electronics in plastic components of various shapes. Major chemical companies such as BASF, Merck, DuPont and PCAS will also be represented at LOPEC with their innovations from the area of material development. In the field of substrates, Schott's glass innovations are particularly fascinating. With ultra-thin glass for reel-to-reel printing, the German technology group already caused a stir at LOPEC 2017. In addition to demonstrators for rollable glass, Schott will be presenting the company’s new portfolio of structured glass wafers this year. The success of printed electronics is also reflected in the increasing number of exhibitors from mechanical engineering. With companies such as Cemitec, Coatema, FUJIFILM Dimatix, Metallograph (SPF-Inc) and Nordson, LOPEC covers the entire spectrum of printing technology—from thermal transfer printers to piezoelectrically controlled inkjet systems.